The Arkansas State Fair and so many other state fairs are long gone (Louisiana being a notable exception). Most of my state’s home festivals are already over for the year. 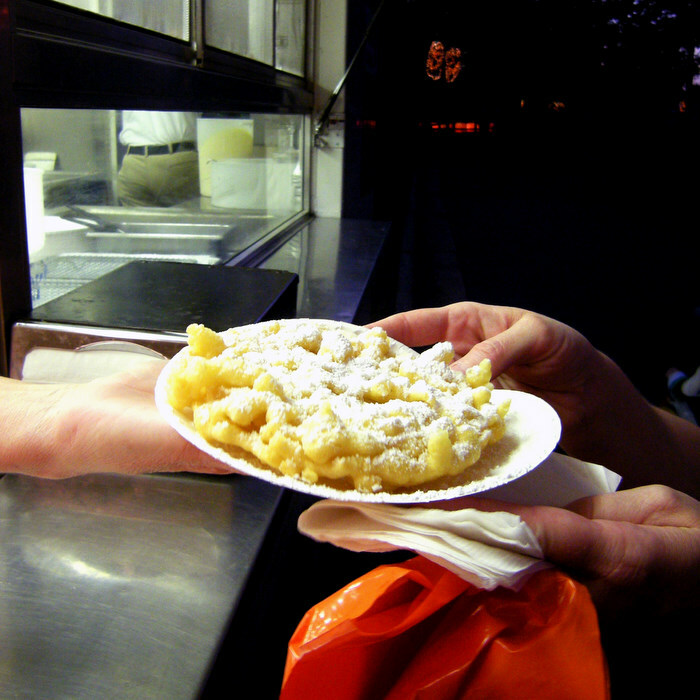 While thoughts are turning to ducks and Christmas here, there’s still one chance to try out a funnel cake before the season is over. You think I’d have enough of fair foods by this time of year, having covered Texas and Arkansas’ fairs and all the little places in-between. And for those weird battered-and-deep-fried items you would be correct. 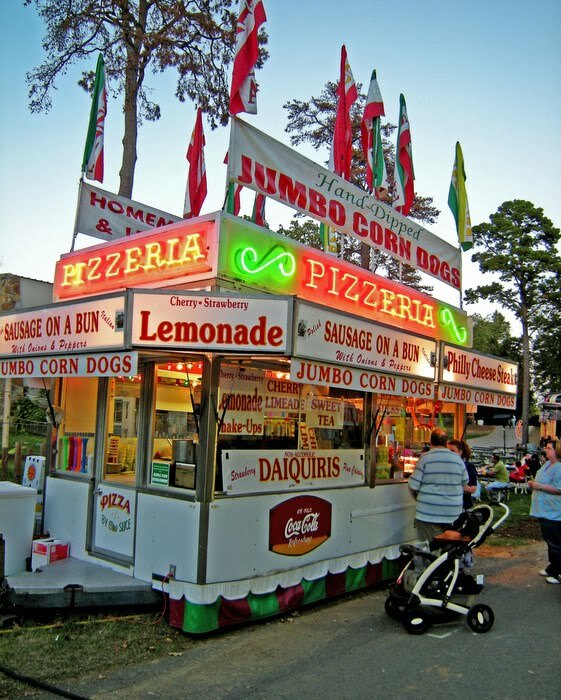 But there’s something about the classics, the corn dogs and cotton candy and funnel cakes…. 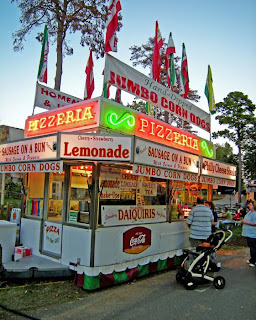 See, somehow or another, I missed out on my traditional funnel cake this year. It’s a family tradition -- Paul and Hunter and I all share one the final day of the Arkansas State Fair. Except this year we just couldn’t get our scheduling right, so the three of us were never at the Fair at the same time together. Yes, I did try a piece off one Leif procured on the last Sunday of the Fair, but it was not the same. But I knew that I’d have one more chance, and I didn’t even have to wait a week. It was waiting for me at the Little Rock Zoo. 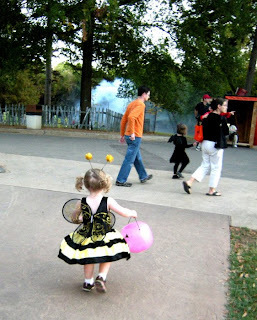 After all, what’s Halloween season without a trip to Boo at the Zoo? It’s a tradition here in Little Rock: during the week and a half before Halloween, the Zoo opens up at night for kids to go trick-or-treating, enjoy a haunted house and haunted train ride and take a spin on Over the Jumps, the historically fantastic restored carousel. Kids get tickets to trade for candy, there are photo opportunities and a dance cave and all sorts of other stuff. I’d be taking Hunter even if I didn’t have some other assignment in mind. 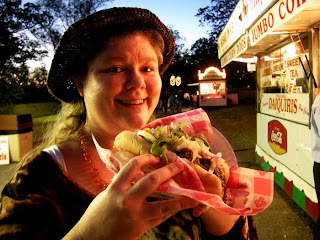 This year, the folks at the Zoo asked if I’d come do one more story -- the story of the food. And that I could do. I was just expecting to talk about the last chance to get that funnel cake, but I found out something else. Read on. Because of wonky work schedules, Paul couldn’t make it out with us until later, so Hunter and Leif and I headed out there to be on-site as soon as the gates opened at 6 p.m.. Right through the gate we encountered a man showing off a snake to interested kids, a magician, and a booth selling jackets and light-up novelties. But we had work to do. We stopped at a couple of the trick-or-treat booths run by volunteers from local groups and Hunter exchanged some tickets for candy. And then we were down to the food vendor area. As I pointed out to Hunter, it was time for Momma to get to work. 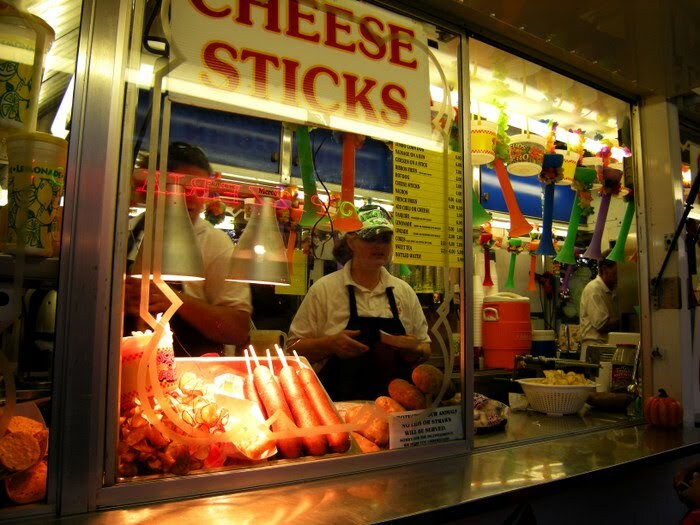 No, the selection isn’t as wide as what you get at the Arkansas State Fair, nor should it be. There are a good handful of vendors set up, offering traditional favorites next to a courtyard near the elephant enclosure where a strange singing clown was murdering Thriller and Ghostbusters, near a screen where fish skeletons flicked back and forth. The light was already waning and I did my best to capture each shot. As I did my job, Hunter dragged Leif up and down the little bit of thoroughfare. Well, it was a big job and I needed to get started. 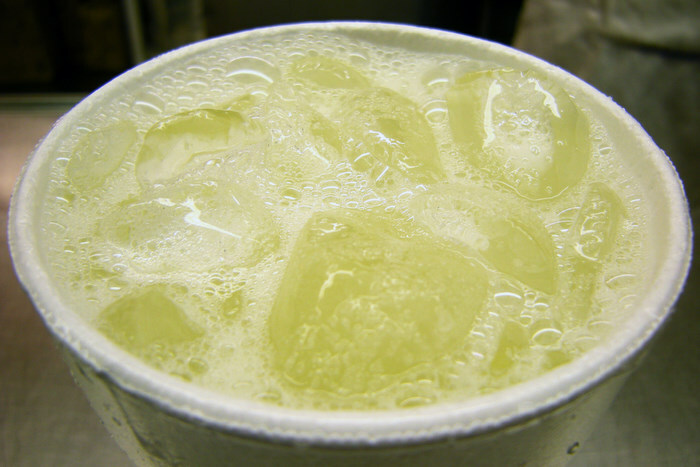 My very first item was the simplest and most necessary -- a cup of lemonade. The lady in the trailer squeezed in a lemon, dropped it in, added sugar and water and ice and placed another cup over the end, martini-makin’ style. Within moments I had a refreshing non- color-corrected beverage that was light and immediately thirst-quenching. Thirst satisfied. 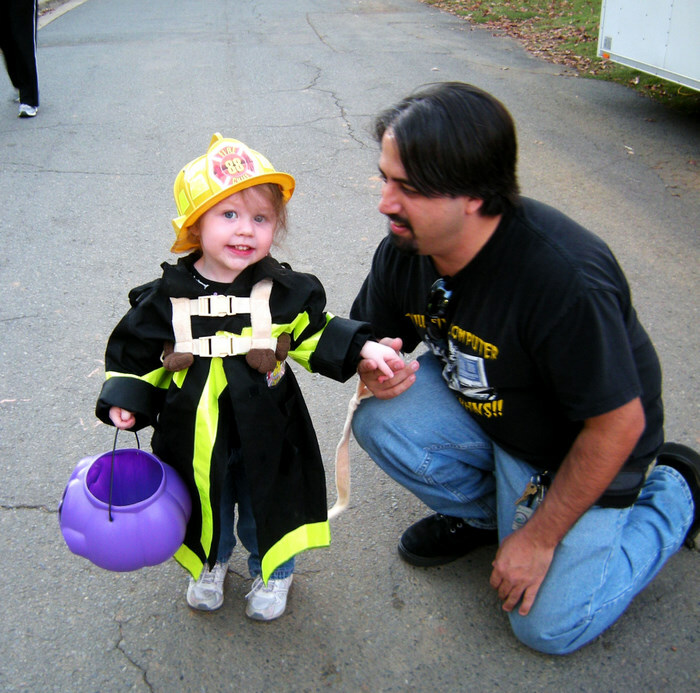 Paul arrived and quickly took Hunter off my hands, letting her run at the end of her tether down to the fire engine, where she played for some time before coming back. I had other things to catch. 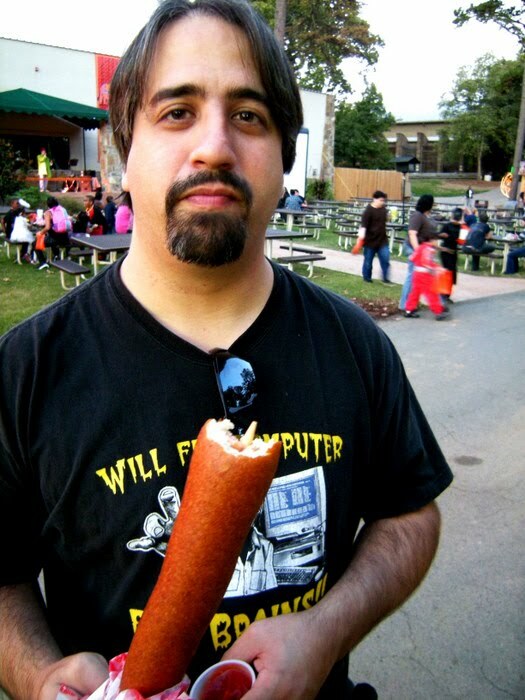 Such as Leif and a corn dog. Corn dogs are one of Leif’s big things, and he seemed pretty satisfied by this one. The State Fair has one really good corn dog vendor (Superdog!) 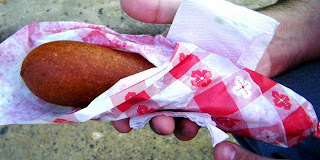 but some of the corn dogs there are sketchy. Something about the batter here, though. I suspect that just like the funnel cakes and cotton candy, the batter of choice is Flossie’s. I should have asked. Well, I guess I was falling down on the job. Me? I wanted to try that Philly Cheese Steak advertised across the way. The meat was simmering away in a hot skillet and the scent was strong. The guys at the Pizzaria set me up with a big handful, a long bun topped with the meat, a little cheese, peppers and onions. Yes, it was a hot mess! Yes, it was good. Now, I’ve never been to Philadelphia, so I can’t attest to the authenticity. But I can tell you that was great strip-shredded beef on a bun, and I enjoyed it quite a lot. It was my second-favorite dish of the night. Paul and Hunter returned. She was hungry, and I fed her a bit of the Philly. The guys kept up with Hunter as I went to sample the next creation, Ribbon Fries. Now, I’ve seen something similar at fairs, but this one was pretty great -- a potato, thinly spirally sliced and dropped into the hot oil, where it expands and creates this strange disc cloud of chips. They’re seasoned. You can have cheese sauce on them -- which I did. I’m not much of a nacho person because I’m not all that friendly with commercial corn chips. 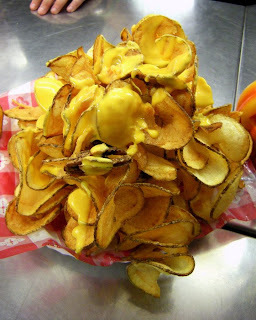 Top potato chips with cheese sauce, though, and I will attack it. This big pile, though, was enough for all four of us. Hunter went to town. She adored the little cheese-spattered chips and kept begging for more of them until she was about to pop. Paul wanted to try the Sausage on a Bun. I’d seen the links roasting in the Pizzaria wagon and had grabbed a few pictures of them, even had a lady stop and let me photograph hers. Mammoth in size, these 1 ½ inch thick logs of meat were quite substantial and looked like they’d pop if you punctured them. 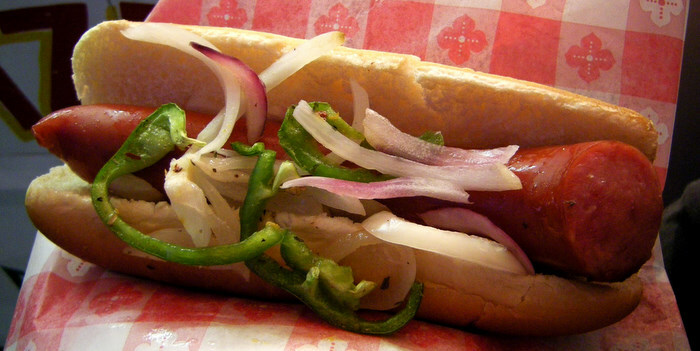 Covered in some peppers and onions, they’re great. 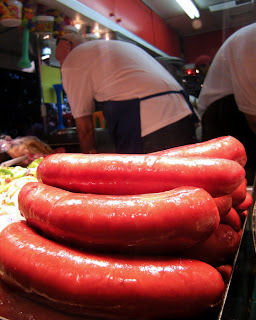 They’re great on their own, too, a big summer-sausage-ish brat-like meat wand full of savory and a big meal in itself. Paul, who’s damn picky and who I usually have to poke for saying something rude about a food at some point or another, was quite satisfied. That’s a lot of food to try, let me tell you what, especially after a couple of weeks of fair perusal. I could have thrown in the towel right then. But I went on and discovered more things. I talked with the vendors as I went along, and I found out a few things of interest. Talked with Rick from Flossie’s for a little while. He was manning a stand selling hot roasted turkey legs and corn-on-the-cob, both of which smelled heavenly. The nicely turned turkey legs are well seasoned. 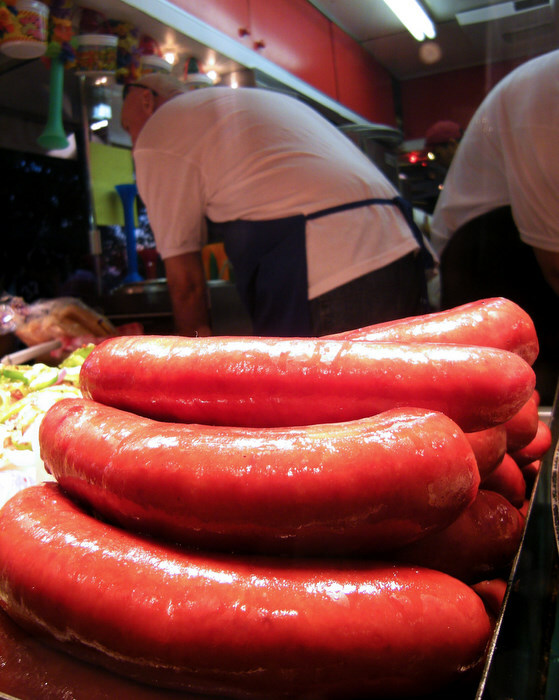 I tend to get one and take it home when I get it because that’s a heck of a lot of meat. 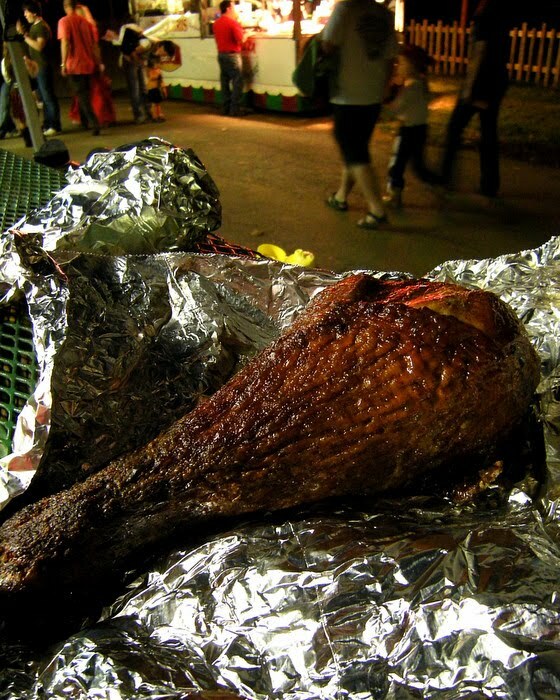 These smoked beauties were wrapped all the way around with aluminum foil, as were the ears of corn, and that’s a blessing -- have you ever tried to wrangle a toddler and a turkey leg? One’s gonna hit the ground and get dirty. Anyway, Rick echoed a lot of what I’d been hearing from the other vendors. All of these folks at Boo at the Zoo are local. That is, they’re all from Arkansas. There are more local food vendors at Boo than at the Arkansas State Fair -- I’m not sure why, but it’s the way it is. Unlike a lot of the vendor situations I’ve seen elsewhere, everyone seemed to be working together to help each other out. 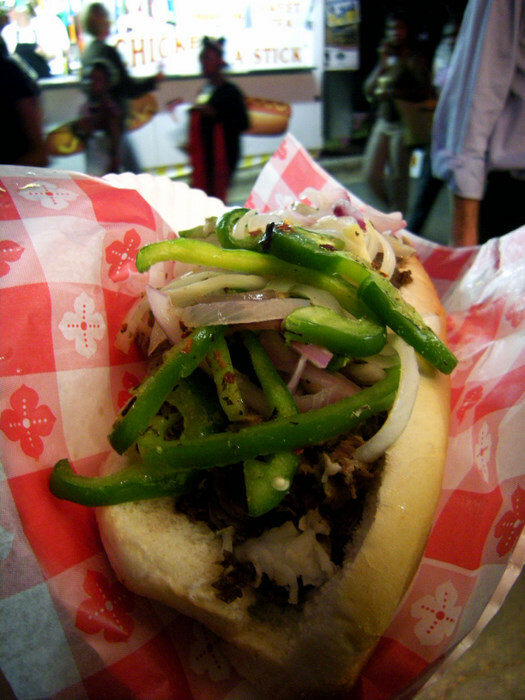 The girls at the Ribbon Fries stand, for instance, insisted I needed to try that Philly Cheese Steak across the way. It was a nice sort of cooperation. Talking with the vendors I discovered something else. I should have noticed it when I was getting my lemonade. Those drinks didn’t come with lids or straws. One of them told me they weren’t allowed to have those straws. I asked Susan Altrui about that this morning, and I agree with her on this -- the straws can be launched by kids into the animal enclosures, and that could harm those animals if they eat them or get them stuck somewhere. Very conscientious. Well, I was almost done. I could have tried absolutely everything, sure, but nachos and cheese sticks and pizza and cotton candy would have just added a lot more inches to my waistline. But I had to have that funnel cake. And so I did. And I took that Flossie’s funnel cake over to the table and sat down with my husband and daughter and friend and enjoyed one of life’s greatest pleasures. Hunter could not get enough of the funnel cake, either, dusting herself down her chin and front with powdered sugar. 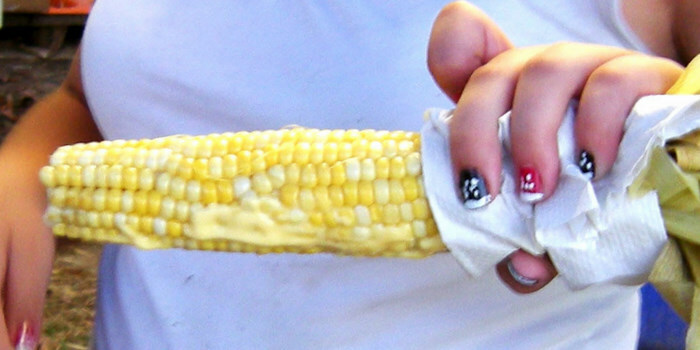 I realized I was glad I hadn’t given in at the Fair. 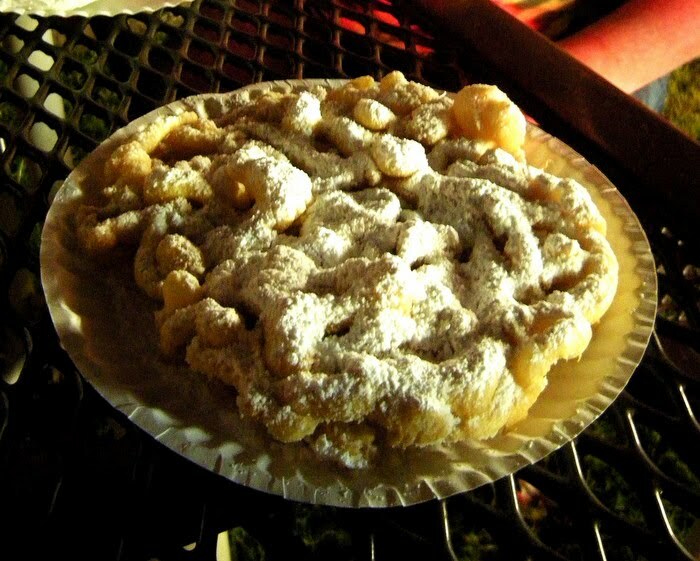 There’s something about a Flossie’s funnel cake that’s different. I did a story last year about the batter that you can order yourself and get sent to your home (or that you can pick up a few places) so you can make it up yourself. I’ve been to a lot of fairs and festivals this year and have sampled bits of funnel cake here and there, and they never quite measure up. I guess you could say this is an endorsement… yeah, it might as well be. 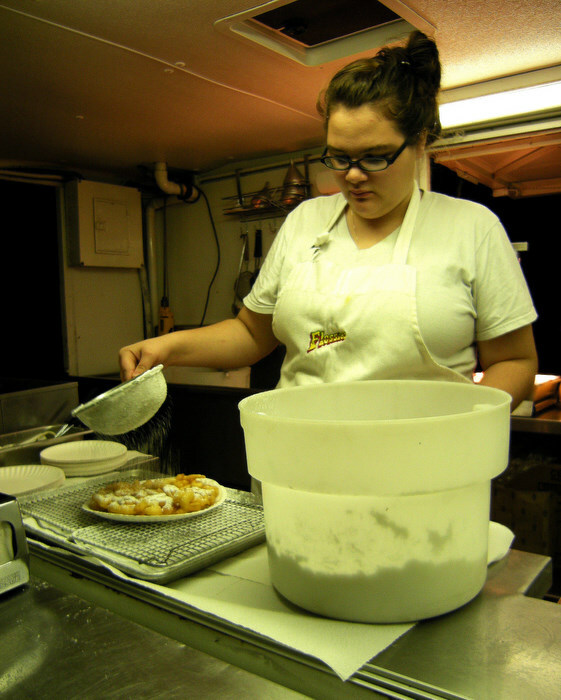 I love Flossie’s funnel cakes. No, we didn’t go home right then. 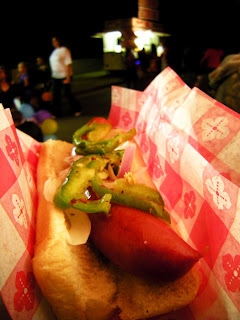 Leif had to leave, but Paul and I took Hunter around the adventure of the Fair. Leif had taken her on the haunted train ride and she did very well. We let Hunter trick-or-treat -- she’s 22 months old now and really gets into it -- and let her dance a bit with the crowd of kids at the dance cave. But her best moment was at Over the Jumps. 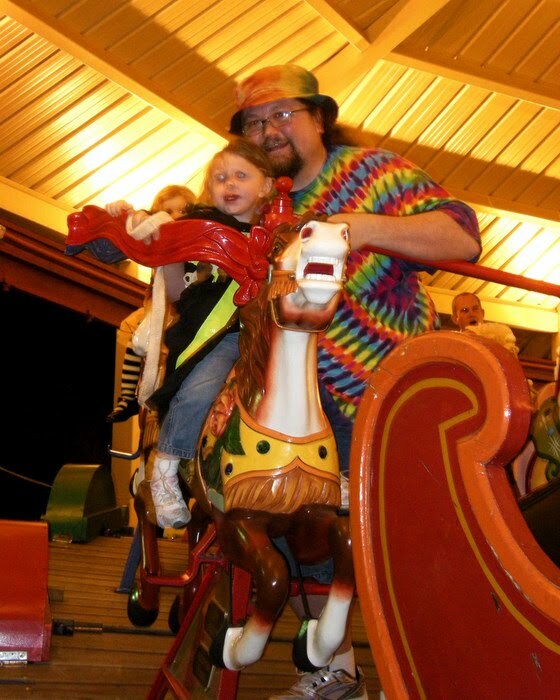 She’s never ridden a carousel before, and I was so glad to get the first chance to take her on one. Over the Jumps is not just any carousel -- it’s the last known “over-the-jumps” carousel known to exist with an undulating track, one of only four built in the world. The undulating track moves up and down with the horses attached to the track. It’s more special to me, though, because as far as I can recall it was probably my first carousel, too -- back when it was housed in the long-gone War Memorial Amusement Park across from the current Zoo entrance. I was nervous about taking her on it at first -- but I knew it’d be an easy ride for her. I stood by her, and at first she seemed apprehensive. But then she started giggling and talking about her horsey, which she petted with each go-round. We got off and she ran for the entrance again. The second and third time her dad took her, and at the end of each ride she asked “one more time?” We eventually had to stop because we really needed to go home. Of course, she didn't make it home awake. Nearly three hours of fun tuckered her out. 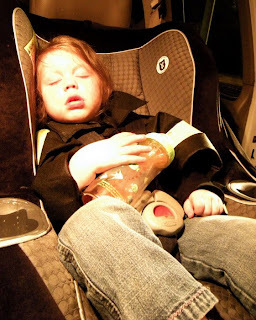 She woke long enough to ask for a beverage before crashing out hard, still wearing her firefighter's jacket. I'm surprised she let us peel it off of her. I’m glad I got to go out to Boo at the Zoo and consider it from another point of view. 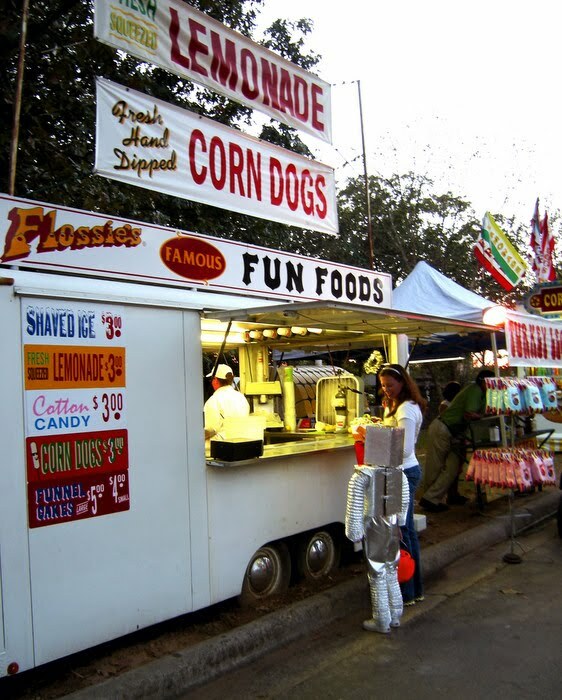 I love that the vendors are all from Arkansas and that my favorite funnel cakes are served up hot and fresh. Hope you like them, too. 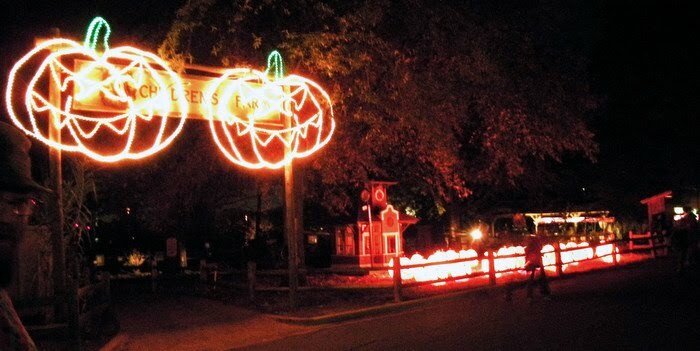 Boo at the Zoo continues through this Sunday the 24th, then does another four days October 28th-31st. It’s a great way to celebrate the Halloween season with your kids in a save and relaxing environment. And there’s a carnival just outside the gate for those who want to also experience the Ferris wheel, the Scrambler and other such amusements. More information can be found at the Little Rock Zoo website.